For seafarers in the Baltic Sea, the shipyard’s central location in the Baltic Sea and proximity to Arlanda Airport make for an easily accessible, effective and reliable shipyard resource. For those of you involved in local maritime traffic in Stockholm and Mälaren, the shipyard’s location in the heart of Stockholm provide proximity and easy access to a full-service shipyard with quays, drydocks and workshops. 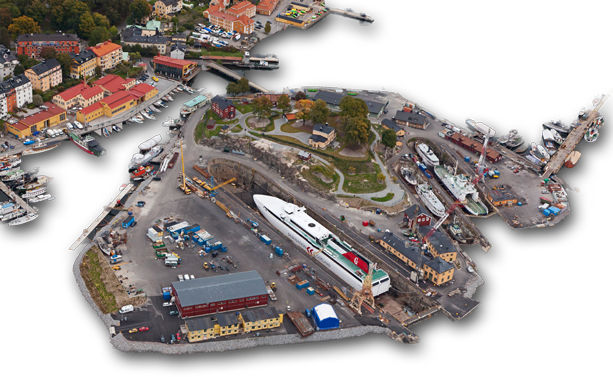 Stockholms Reparationsvarv AB is located on the shipyard-based island of Beckholmen, in Stockholm. The island is one of Sweden’s oldest active industrial zones, stemming from the 1600s, and has served as a repair yard since the 1850s. Beckholmen is located in the Royal National City Park. We annually repair between 50 and 100 vessels at the shipyard and provide every essential service to our customers regarding the repair, maintenance and conversion of vessels. We also dispatch riding squads to other ports when necessary. We are fully equipped with drydocks, cranes, quays, storage facilities and workshops. Our drydocks measure 180m by 25m, and 100m by 16.5m. Our quays measure 75m with a depth of 5m, and 150m with a depth of 6-12m. We serve all types of vessels including cargo, tankers, ro-ro, tugboats, barges, archipelago boats, service vessels and passenger ships. On behalf of the Swedish government, we repair coast guard vessels, transport ferries, naval vessels and icebreakers. The shipyard is certified in accordance with the ISO 9001 – Quality management and ISO 14001 – Environmental management standards.